Deliver superior products and escalate your market share by employing real-world user experience success strategies from global corporations. 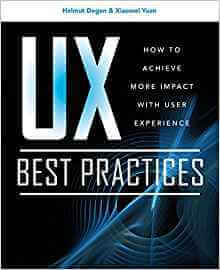 Featuring in-depth case studies from Yahoo!, Siemens, SAP, Haier, Intuit, Tencent, and more, UX Best Practices: How to Achieve More Impact with User Experience offers proven methods for instituting user-centered design in industrial environments. Discover how to integrate user experience activities into product development processes for investment and consumer goods in different regions, reduce product complexity, increase product quality, and boost the bottom line. This comprehensive guide covers a variety of user experience techniques, such as analyzing user needs and expectations, creating design concepts, prototyping, using agile development, conducting usability testing, developing user interface guidelines, defining user interface patterns, and specifying metrics.